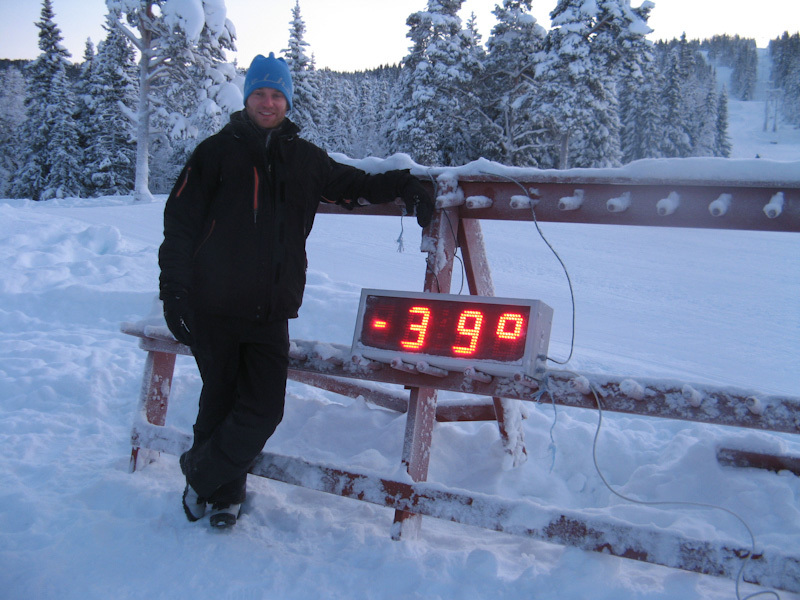 Central Norway is the coldest place in Europe. Contrary to the apparent logic, moving further north you will find yourself within the range of warm Mexican current, which makes Barents Sea and Norwegian Sea never freeze. Therefore the air temperature has also relatively small fluctuation over the year. In Gålå situation is different. The temperatures I experienced here during winter stayed for most of the time in the range of 10 to 30 degrees below zero. Sometimes there were warmer days and at times also colder. For more than a half of January the mercury column had never climbed above level of minus 30 degrees. The culmination occurred when for several days we have had 40 degrees below zero. 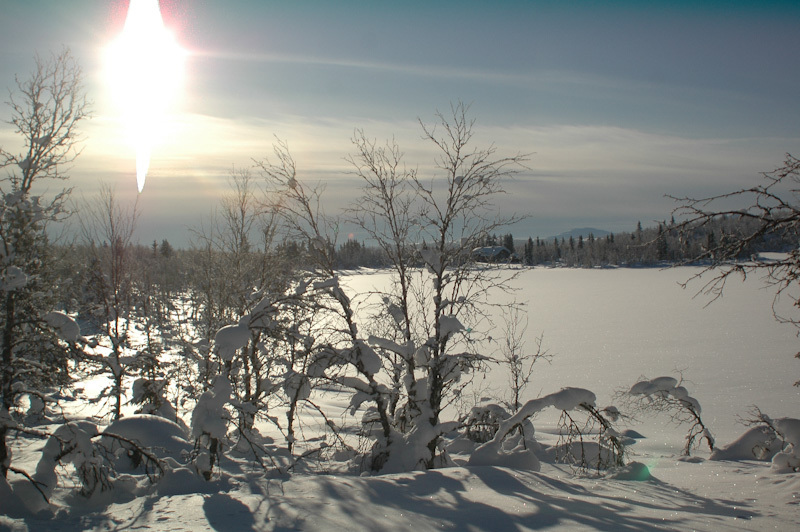 In the range from -5 to about -20 degrees below zero at a relatively low humidity, the body does not feel a substantial temperature change, you breathe naturally and you can easily spend the entire day outside and eventually get used to it. When the temperature drops to -25 degrees the first difficulties in breathing arise. There is also a risk of hypothermia if you inhale a lot of cold air during an extensive physical effort. At -40 degrees there are significant problems. Cross-country skiing downhill at this cold with a reasonable speed of 20 km/h makes your tears freeze and your eyes immediately covered with a thin layer of ice. Ice crystals are not only inhaled, they also pinch your lungs. 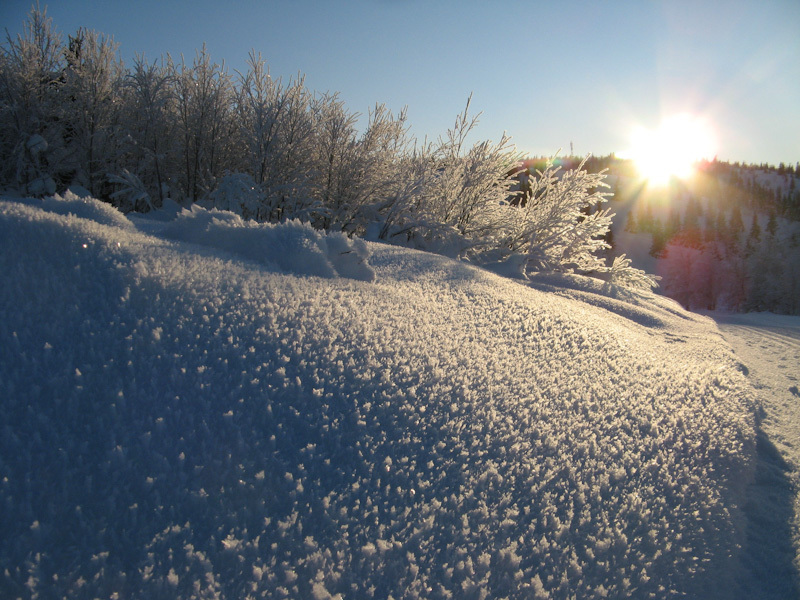 Shortly after your nose and cheeks become white and a chin, eyelids and eyelashes are covered with snowflake-like frost. This is the temperature at which it is not possible to perform physical activity. The temperature of -25 degrees can also be very dangerous. One day I taught skiing the whole day. Instead of taking a break between lessons to warm up in a hut, as any reasonable person would have done, every time I rapidly changed into my other boots to ride a snowboard. At some point I didn’t notice my soaked socks that were at that time already frozen, along with my toes. Yngve, wearing a thick hat, woolen clothing and insulated boots begins a sentence – “let me teach you three lessons“, once a crazy Norwegian hippie, now a cold weather pundit, a fellow lift-guy and an enthusiast of the mountains continues – “wool, wool, wool“. Only wool clothing is the key to success in overcoming the real frost. I degree. Red color. The most common frostbite, usually accompanied by a temporary loss of sensation in fingers, toes, nose or cheeks, which are red. May hurt a bit and it is gone once you warm it up. II degree. White color. About 60% of a human body is water, which can also freeze. Should this happen, the skin turns white. It is already quite dangerous, so keep in mind that always when you notice a person (or yourself) whose skin suddenly has become white the part of body needs to be warmed up. You need to move to a warm place, otherwise … risk of III degree. III degree. The entire color palette. Partial death of tissues. Initial symptoms include numbness, which last for several days followed by severe pain. Then, as a result of swelling, the bladder with serous fluid is formed. The skin changes color from white through red, black to purple. In my case, I completely lost the feeling in left big toe, which rose to the size of a table tennis ball. There has been 3cm3 of serous fluid let out of my big toe bladder (it is absolutely gross!) at the frostbite faculty in hospital in Lillehammer. IV degree. Black color. Death of tissues. In the state of serious hypothermia the body is not able to provide more energy to warm up limbs or other body parts and the third degree of frostbite becomes even more serious resulting in the need to amputate the frostbitten part of body. This is the worst option, but nothing can done to help it. The human body is designed so that different parts of the body have assigned priorities on the energy would be delivered to them. When there is a deficiency in energy to warm up the entire body, the first to experience power-cuts are our hands and feet, then comes the trunk (which is already a danger to life), and finally the required heat supply is not being delivered to head anymore. It took me six moths to recover sensation in my big toe after experiencing the third-degree frostbite. A moment of inattention can have serious consequences, so I encourage you to make sure you are well prepared for every expedition in the cold. By no means I advice you against the cold. The extremely cold temperature is fantastic, so are many other extremes occurring in nature. Note the local proverb, which says “ There is no such thing as bad weather, the may only be an inappropriate clothing“. To conclude I also pass along the wisdom obtained from Yngve – wool, wool, wool.